The XAROSA brings you to the next level of EM imaging. With its unrivaled 20 megapixel CMOS image sensor it sets new benchmarks in speed, resolution and price performance ratio. Our exciting new TEM CMOS camera XAROSA provides more than 30 frames per second in its full 20 megapixel resolution in live. Utilizing a modern Thunderbolt™ interface a high quality and high speed data transfer to modern workstations is always guaranteed. In combination with our state of the art imaging software RADIUS the XAROSA provides video recording, high-dynamic range imaging (HDRI), smart averaging and drift correction. And the best thing about it is: the XAROSA brings this all to you out of the box, no additional options needed. EMSIS understands how to provide the best fit of resolution and sensitivity for all TEM applications, proven manifold already with our well respected current fiber optical coupled cameras, used all over the globe. This concept once again comes to live with the XAROSA, achieving the perfect match between pixel size, fiber optics and scintillator. The use of a high-quality and tailored tapered fiber for the XAROSA enlarges the field of view and adapts the effective pixel size ideally at the same time. 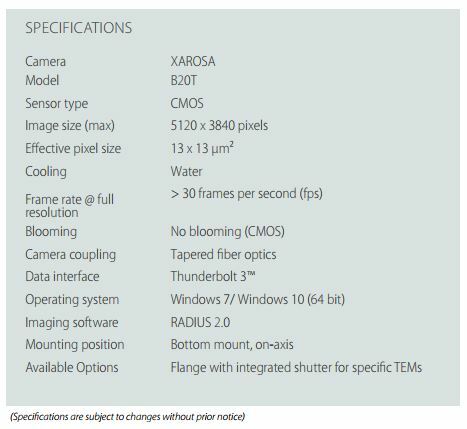 The latest CMOS technology of the XAROSA brings to you speed, sensitivity and high dynamic range. The CMOS image sensor shows no blooming and hence is best suited also for diffraction images. The best TEM camera would not be complete without the best TEM acquisition and imaging software: our RADIUS software provides everything you need and more: as a dashboard for your camera-TEM system it combines full camera control with TEM control. Features like drift correction, “click-to-center”, smart averaging, full interactive measurements and the integrated image database eases your daily work routines.